It seems hating the Dallas Cowboys has become as trendy and as popular as loving them. On the surface, that should surprise nobody. Rene Descartes once said, "It is easy to hate and it is difficult to love." 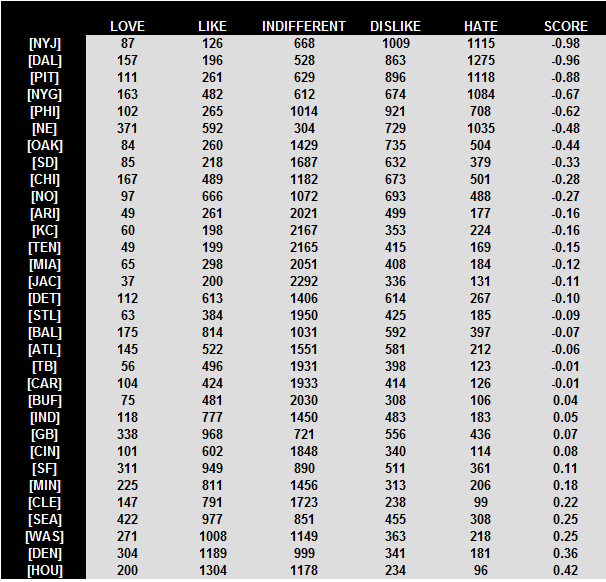 And when you're in a league of 32 teams, your haters should outnumber your adorers by a ratio of approximately 31-to-1. "From the deepest desires often come the deadliest hate," said Socrates. Sports fans are as passionate as they come, and the desire to win championships is so deep that parallels are arguably impossible to find at the avocational level of the public sphere. 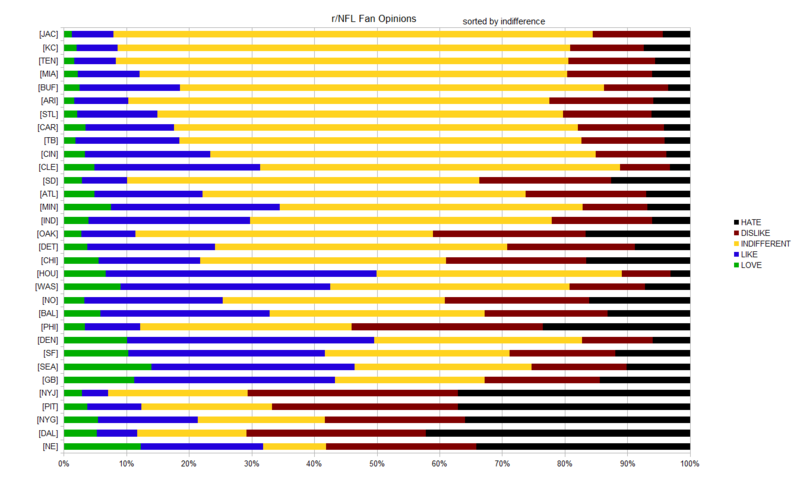 But there's evidence that the Cowboys are both the most loved and loathed team in the NFL. Every Harris poll conducted on the matter since 2007 has concluded that Dallas is the league's most popular team. And the latest Public Policy Poll had them in second place, just back of the Peyton Manning-led Denver Broncos. But that same poll found the 'Boys were also America's least favorite professional football team. As Ben Blatt of Deadspin points out, the franchise still dominates its NFL peers when it comes to Facebook "likes," and a recent Emory University study cited by Michael Zennie of the Daily Mail found that the Cowboys have the league's most loyal fanbase. Yet a survey of over 3,000 fans on Reddit showed that, again, the Cowboys are the most hated team in America. 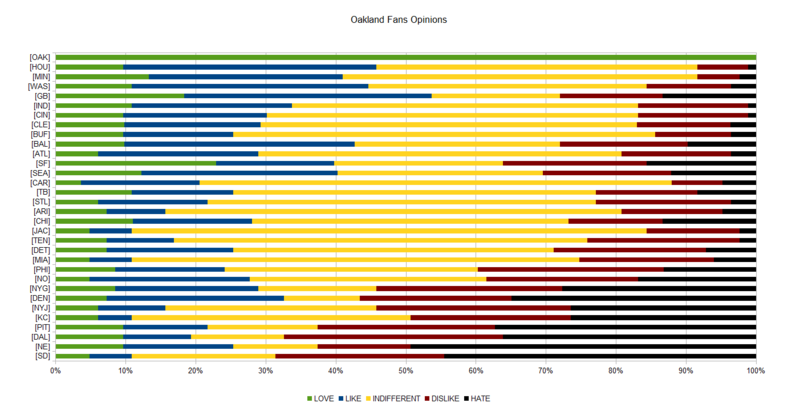 According to that Reddit survey, Dallas has 13 different rivals (42 percent of the league), with fans from exactly zero opposing teams exhibiting a positive opinion of the franchise. No other team possesses that type of discrepancy. In fact, Raiders fans hate the Cowboys, who aren't even in their conference, more than they hate the division-rival Broncos. 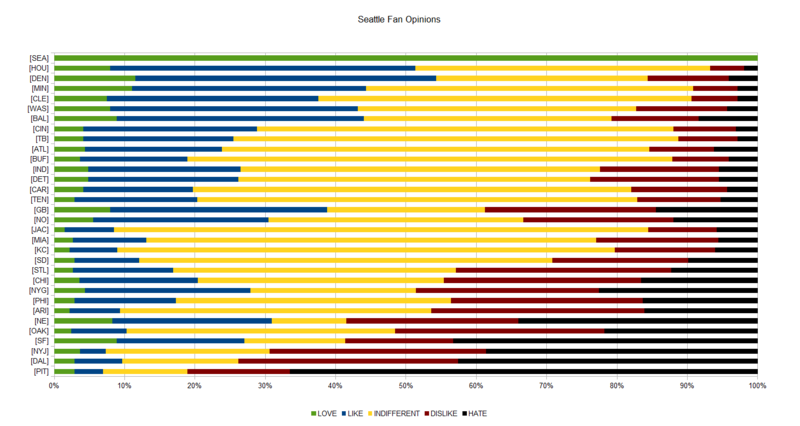 And Seahawks fans despise the Cowboys more than the division-rival 49ers. So what exactly is it about the boys in navy, silver and white that makes them so polarizing? It can't just be about the fanbase, right? Cowboys fans can certainly be arrogant, but fans from New York (Giants or Jets), Boston and Philadelphia also have less than pristine reputations. But nobody cares about a loser, and the Eagles have never won a Super Bowl. The Jets haven't won in nearly half a century, and the Giants and Patriots—who also draw a lot of haters, according to the sources above—have won often, but not as much as the Cowboys (five Super Bowl titles in eight appearances). This is the most obvious factor at play, but it's a tricky one. See, when you're good, you attract bandwagon jumpers—which probably explains why, in an ESPN poll, the Heat, who have been to four straight NBA Finals, recently overtook the Lakers as America's favorite NBA team—while also generating resentment and jealousy from those less fortunate. That, along with some but not all of the other factors we're exploring here, might explain why a Nielsen study cited by David Biderman of the Wall Street Journal found the Yankees and Red Sox are among the five most despised teams in baseball, while Harris polls from each of the last three years have concluded that those two teams are in fact America's favorite. Heat, Lakers, Yankees, Red Sox. Sure, they get a lot of exposure and represent big markets. But they have a polarizing effect on America mainly because they're extremely successful on the court and field. That even appears to apply to individual athletes. Nielsen Sports and market research firm E-Poll found that Kobe Bryant—who is unarguably one of the greatest NBA players of all time—was the nation's 10th-most disliked athlete in 2013, while an ESPN poll from one year prior concluded that Bryant was America's second-favorite athlete (it should be noted Tim Tebow was America's favorite that year). But here's the thing: Unlike those guys, the Cowboys haven't been remotely successful for pretty much a full generation. People may resent good teams, but the Steelers have more titles (six) than Dallas, and the 49ers have just as many. The Dolphins have nearly an identical all-time winning percentage (.564 to the Cowboys' .567). Why don't those teams take as much crap as the Cowboys? Even if we give Miami a break because it hasn't won in 40 years, the Steelers and Niners have been considerably more successful than Dallas in recent seasons. Yet according to that same survey from Reddit, Pittsburgh and San Francisco have only 14 "rivals" combined, with a combined 16 fanbases exhibiting a positive opinion of them. Why are people willing to be friends with the Steelers and Niners but not the Cowboys? It could have something to do with the love they get despite the fact they haven't been particularly good on the field. Maybe that's it. Maybe it's the perceived sense of entitlement the Cowboys flaunt. Don't underestimate the effect the "America's Team" moniker has on this franchise. "It's a polarizing statement," Michael Broder, a Philadelphia-based media psychologist, told Bleacher Report. "It obviously does more good than harm, otherwise it wouldn't be used. But it is a polarizing statement because those who have their loyalties elsewhere don't want to prop the competition up at all." Read any fan forum or Reddit thread on the debate regarding whether the Cowboys are indeed "America's Team," and you'll find some extremely passionate arguments against the notion that they have the right to stake such a claim. They appear on television so often that their faces are as familiar to the public as presidents and movie stars. They are the Dallas Cowboys, "America's Team." Which leads us to the coverage the team has always garnered from the press. There's somewhat of a chicken-or-egg causality dilemma at play here, because the Cowboys have dominated national television since the 1970s. It's not as though networks randomly chose Dallas over other NFL teams; instead it seems they were in the right place (on-field success, All-American quarterback, popular football market) at the right time (just as football was beginning to overtake baseball as America's most popular sport). At that point, it could have been argued broadcasters had little choice but to continually feature the Cowboys, but the increased attention only exacerbated the team's popularity. It became a virtuous cycle as the two empires grew together. The impact from that cycle continues to linger today. After another Dallas dynasty sprung up in the 1990s, the Cowboys have such a deep fanbase that ESPN and its competitors would be crazy not to keep the spotlight on them. But they've created a monster. As Broder explained, the more you see of something, the more compelled you are to formulate an opinion on it. So while, for example, the Jacksonville Jaguars continue to reap indifference as a franchise that is by and large out of sight, out of mind, almost nobody is indifferent about the teams that monopolize First Take and SportsCenter, especially when they play on national TV more than anyone else. That was the case again this past season with Dallas, and the 'Boys crushed it in terms of ratings and viewership, leading Adweek's Anthony Crupi to hypothesize that some people have been "hate-watching" Tony Romo and Co.
That's why, according to that Reddit survey, teams like the Cowboys, Patriots, Giants, Steelers, Jets and Packers have the lowest indifference rates and the highest rates of polarity. That doesn't totally explain why the Cowboys are so strongly disliked, but Arthur Raney, a professor of communication at Florida State University and editor of the Handbook of Sports and Media, brings us back to the point about the attention not being proportionate to the amount of success the team has experienced lately. "The Cowboys have won one playoff game since Bill Clinton was in office, but yet they still act—or rather, Jerry Jones acts—like they are perennial Super Bowl contenders," Raney told Bleacher Report. "And the football media do as well. In general, I think the cause for the resentment may be less about coverage but more the fact that the amount of coverage seems unwarranted in light of their performance." So we're looking at a dangerous mix of hubris from the subject, over-the-top coverage of the subject, a legacy of success and a poor 21st-century track record. "Dallas is the Justin Bieber and Taylor Swift of the NFL," Redditor Kelzer66 wrote last year. "Trendy, annoying, overplayed, over-hyped, and force-fed to us even though the majority of us cannot stand them." "It's about the brand," concluded Broder. "When they're able to make their brand that pronounced, I think you want to belong to that. And when you're not, you basically want to say, 'Hey, what about my team?' If you're getting an opposing brand in your face, that's going to give you equally negative feelings." Oh, the brand. That brings us to Jerry Jones, the NFL's preeminent salesman. See, the Steelers might be good and they might hog headlines, but it's hard not to appreciate the Rooney family. Jed York has a pristine reputation in San Francisco, as do Bob Kraft in New England and the John Mara/Steve Tisch duo that owns the Giants. And all of those owners know how to let the football people do the football business while keeping themselves out of the spotlight. But the brand-oriented Jones has probably alienated more fans than any other soul that has come in contact with this franchise. The bravado is too much, especially considering how poorly the team has fared the last two decades—say what you will about Mark Cuban, but at least the Dallas Mavericks have been winning—and people understandably have trouble separating Jones the tycoon from Jones the general manager. As you know, the Cowboys have not gone to the playoffs in several years. We have not gone, yet we’re the most popular TV show there is on television. We lead all teams in TV ratings. We lead, 24 of the last top 25 shows were NFL games, and any time your Cowboys play they’re up there at the top and leading. So, while many teams have inspired resentment by way of their past and/or present success, and while many other teams are overexposed, it seems the "America's Team" label, a disproportionate degree of exposure and—maybe more than anything—the presence of Jerry Jones is what separates the Cowboys from everybody else in the hate column. The recent spate of polarization also seems to be tied to Jones. His insistence on running the show, despite the arguably mediocre results, surely rubs many fans the wrong way. One could argue that he has turned the Cowboys into a villain: rich, arrogant, self-promoting. "My stadium is bigger than yours." Thumbing his nose at the "typical ways of managing a team." In some respects, hatred for the Cowboys really seems to just be a byproduct of disdain for Jones. I doubt that the Cowboys would be the most covered team in the NFL if they were owned by someone other than Jerry Jones. He keeps them in the news; he fuels the overexposure. Some love it. But many hate it. Sports media love it, because Jones is always a story in waiting. As much as anything, it seems that Jones is the true villain, the source of the conflict. I promise that's the response you'll get from most Cowboys fans. And that's cool. At this level, football isn't about friendships. In fact, it's amazing how often sports fans revel in the animosity. Some of us seem to feed off the contempt, which on the surface sounds unusual but actually makes sense when you consider the nature of sports. "Sports is about conflict," said Raney. "It is about winners and losers, heroes and villains." And as long as that continues to be the case, the real winners will be those capitalizing on such divisiveness. "For some, the Cowboys will always be the heroes. For many others, the Cowboys and their owner have become the villain," concluded Raney. "It matters little to sports media which side you are on, as long as you are on one of them."